With Modern Combat: Sandstorm, the first-person shooter genre on the iPhone takes a giant leap forward and then trips over its shoelaces and tumbles into a landmine. 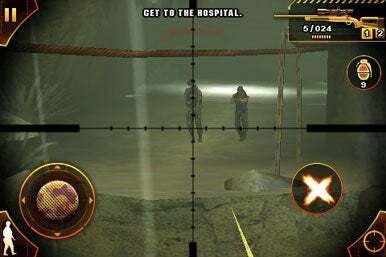 Ready, Aim, Fire: The zoom mode in Modern Combat: Sandstorm allows for pinpoint aiming from long distances, particularly when you’re using the sniper rifle. The graphics, controls, combat, and weapon selection of this military-themed shooter from Gameloft are all top notch. Borrowing some of the best elements from Call of Duty 4: Modern Combat (including part of the title, it seems) Modern Combat: Sandstorm is 85 percent of a great first-person shooter. Sync issues, bugs, terrible dialogue and a rushed plot hamper what could have been the definitive iPhone title for the year. Despite its flaws, it’s still arguably the best first-person shooter I’ve played on the platform. In Modern Combat: Sandstorm, you play as a US soldier named Jones, also sometimes referred to as “Chief,” who has just returned to his fighting unit in an unnamed Middle-Eastern country. You’re tasked with stopping an unnamed terrorist group on your first mission—not surprisingly your unit is ambushed just when you’ve tracked down the head bad guy. Now you must find him before he does something bad, save your squad mates, and collect every cliché possible on your way to saving the day. Any game that calls its protagonist “Chief,” has a heavy weapons guy named “Dozer,” and features a Jamie Fox-lookalike named—yes—“Fox” isn’t just nodding to convention, it’s wallowing in other people’s ideas like a pig in mud. There’s also a low-ranking soldier named “Ryan” in the game, leaving the only squad mate you have who isn’t a character from another movie or game your superior officer, Captain Jones. His quirk is to consistently call your squad “knuckleheads” and then, in a poorly developed plot twist, betray your unit in the last scene. While the plot, voice acting, and dialogue are in rough draft form, the combat is much more refined. Developers are struggling to produce a decent set of first-person shooter controls for the iPhone. Big titles from yesteryear such as Doom and Duke Nukem stumbled in their introduction to the iPhone platform, but Gameloft may have finally broken the code. Sandstorm’s control scheme is why-didn’t-I-think-of-it-first kind of simple. You move with your joystick, allowing the player to strafe (essential for FPSs), and aim by flicking your finger across the touchscreen. If you need more precision in your firing, there is a zoom crosshairs button in the corner. Capable players will essentially move to a good combat location and then fire exclusively while using the zoom function. By the third mission, the game controls were some of the most intuitive I’ve played on the iPhone. To Gameloft’s credit, your cookie-cutter NPC squad mates are actually decent shots and will kill enemies for you, and if you’re really in a bind, you can use them as bullet sponges while you cower in a corner and pick off stragglers. Though you pretty much are an army of one, there are several periods in the game where you’re in combat along with your squad mates and feel part of a greater war. You’ll have a full arsenal of weapons available for your use against the nameless terrorists, but as a concession to realism, you can only carry two at a time. You can also throw different kinds of grenades or toss back grenades that have landed near you. There’s also a melee attack that works some of the time if you’re close enough to an enemy. The guns have different ranges, ammo capacities, and reload times—it’s great to see Gameloft pay such attention to detail. Though you won’t see any environmental damage from your weapons, its still really satisfying to find an RPG launcher in the streets and use it to take out an enemy tank or a clustered group of bad guys. Despite taking place in a generic Middle-Eastern country, the mission environments provide some variety, taking you from boot camp to the streets to a warehouse and finally to the obligatory underground bunker (featuring an elevator segment cribbing off Metal Gear Solid). Each mission will take you about 15 minutes to complete, giving a total playtime of about three hours. Even on “easy,” there are moments when you’ll struggle to get past a specific bottleneck or you won’t react in time to throw back an enemy grenade. The enemy AI isn’t particularly advanced, but they do run for cover, throw grenades and occasionally show willingness to melee attack you. You’ll understand their patterns pretty quickly, but it doesn’t mean you’ll always have the reflexes to dodge an incoming RPG. You Can Run, But You Can’t Hide: Try as he might, the main boss can’t get unstuck from behind a barrel—one of the glitches in this early version of Modern Combat. The dialogue is atrocious, the voice acting is amateurish, and the plot is wafer thin. The ending two chapters feel like the developers realized they weren’t going to make deadline and just hoped that people wouldn’t notice the huge plot holes. Similarly, your orders are convoluted, and sometimes the objective arrow points you only vaguely in the direction you’re supposed to go. There are some clipping and path-finding issues, and the game still has some noticeable bugs. On the second to last mission, the main boss got stuck running behind a barrel, and though the script dictates that he runs away, I caught up to him and watched him frozen in place. 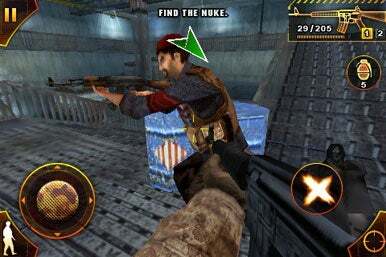 Modern Combat: Sandstorm utilizes a checkpoint save system with infrequent checkpoints and no ability to manually save. When Gameloft updates the game, hopefully it can fix the sync issues that occur between dialogue and events (sometimes your comrades will react to things before they’ve happened), fix some of the bigger bugs, offer a manual save system, and most important, offer multiplayer. Modern Combat: Sandstorm was produced with some great ideas and a beautiful control scheme that is marred by a rushed ending and a lack of polish that leaves some seams visible. It’s not surprising that Gameloft is the first developer to create a really compelling first person shooter for the iPhone, but it is surprising it shipped a game that feels like a work-in-progress. Modern Combat: Sandstorm is compatible with any iPhone or iPod touch running the iPhone 2.2.1 software update.